So my morning train so far this week has been conductorless. Not to say he isn’t there, but I just haven’t seen him. Guy got switched to another job, and whoever took his place, well, I don’t know if this guy actually collects tickets. Considering this is a morning peak train going to Grand Central, I would think that tickets would sort of be, I don’t know, important? Really it doesn’t matter to me one way or the other, I have a monthly anyways. But there are a bunch of people that I know don’t, who just happened to get two free rides so far. Kid: Is your name really Guy? Guy: When I was first born, my parents didn’t know what to name me. So back then they called me Boy. Now they call me Guy. And after fifty they’ll be calling me Man. Oh well. Tomorrow I have to go to the city for a meeting, so I’ll be taking a different train than normal. I won’t see if we go a third day in a row conductorless. I suppose it is getting rather close to elections, and because politicians apparently adore White Plains, they’ve frequently been hanging around the station. And everybody knows how much I love politicians. Or rather, how I love to draw on their brochures. Last week folks were passing out stuff for Andy Spano. I couldn’t do anything too terrible to his face, because he looks a lot like my now deceased grandfather. I was amused by the fact that along with the brochure, they gave out antibacterial hand gel. What kind of political message does that get across? That we are dirty, dirty people? 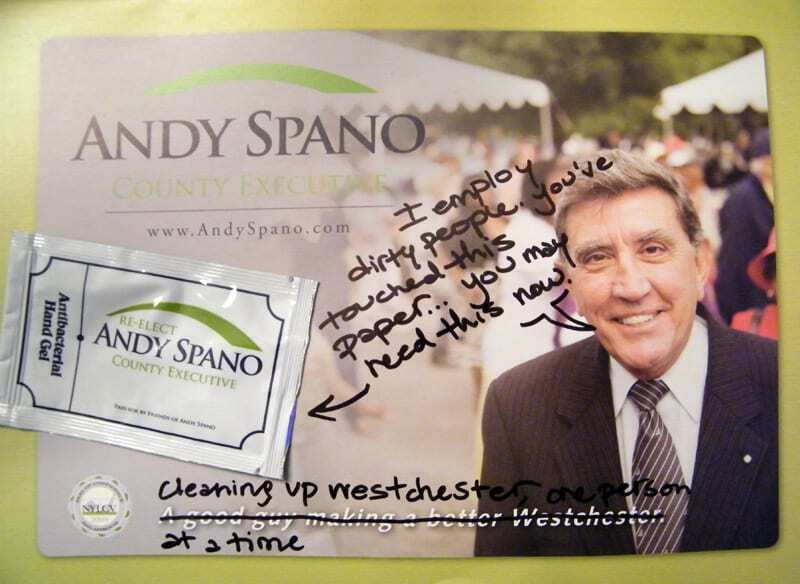 They totally missed the chance at cheesy marketing: Andy Spano, cleaning up Westchester one person at a time! I left this on the ground at White Plains, in case one of the crazy people needed it. In other news, the Cat Girl has returned. There are many people that ride the trains, passengers as well as conductors, that know me merely by the name Cat Girl. All because of my cat hat. Since the temperature has begun to get colder, I’ve taken out the hat and have been wearing it for the past week or so. 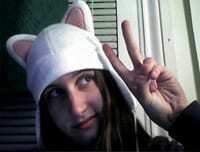 I always say that the cat hat spreads joy wherever it goes. Something quite so silly and minor, does in fact make people smile. An elderly disabled war veteran in White Plains. A woman whom I’ve nicknamed Ginger, who told me that every morning she sees me wearing the hat, it makes her smile. A rather effeminate young man was curious to know where one could purchase a hat similar. And you, passenger, I saw that little tug at the side of your lips, a barely-there smile, when I got on the train. Since I’ve been asked far too many times, the hat was made by the wonderful Susan over at Boshi-Basiik. They make some incredibly cute hand made hats there, so do take a look.